when thanksgiving & pumpkin season is officially over, i dive head first into all things gingerbread. honestly i couldn't tell you which flavour i like better! both are so cozy & incorporate the best baking spices. 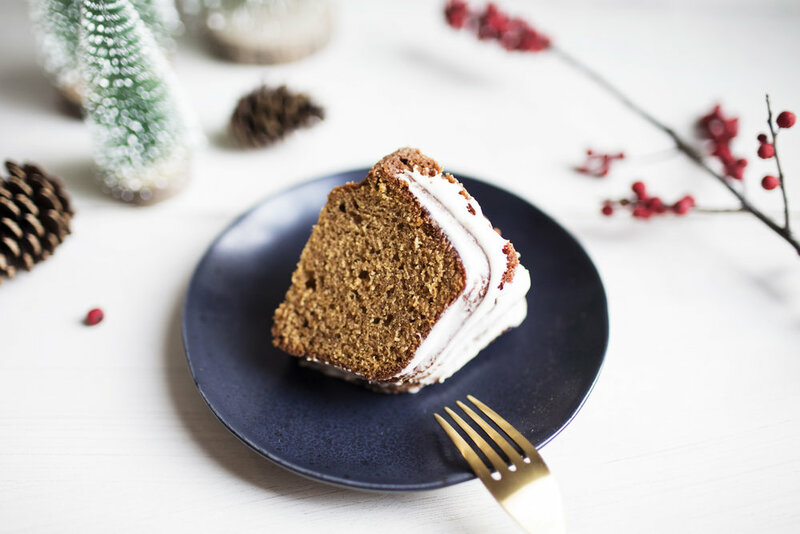 this gingerbread bundt cake includes my two favourite christmas flavours: gingerbread & eggnog. it has a creamy eggnog glaze that looks like a little dusting of snow on the cake, doesn't it? i also snuck a little eggnog into the cake batter too because.. eggnog. i am declaring this holiday season the season of bundt cakes because i have made quite a few bundt cakes over the last month. they are much easier to make than a layered cake & present just as beautifully! i also love all of nordic ware’s unique bundt pan designs. this cake was made in the “brilliance bundt pan” which is part of nordic ware’s premium gold collection. it’s a bold & radiant bundt shape that launched this year! the heavy cast aluminum ensures the cake evenly bakes & browns, plus it has a premium nonstick surface which makes for an easy release. i know how stressful flipping over a bundt cake can be, trust me. with a little grease & flour, this cake will slip right out! just make sure it has cooled enough before removing as the cake will be a little fragile if still warm. p.s guess what? i will be giving away the brilliance bundt pan over on instagram this weekend!!! the perfect gift for bakers or yourself this holiday season. you can enter the giveaway by clicking here. good luck! preheat oven to 350 degrees. grease & flour bundt pan. in a large mixing bowl whisk together the oil, sugar, molasses, eggs, vanilla, eggnog & yogurt until well blended. in a separate mixing bowl sift together the flour, baking powder, baking soda, salt, ginger, cinnamon, nutmeg, cloves & black pepper. add the flour mixture to the wet ingredients & beat until smooth, about 2 minutes. transfer batter to the prepared bundt pan & bake for 45-50 minutes, or until the top bounces back to touch. let cool to room temperature before releasing from pan. in a mixing bowl whisk together the butter, eggnog, vanilla, powdered sugar & salt until smooth. if mixture seems too thin, add a touch more powdered sugar. if mixture seems too thick, add a touch more eggnog. pour the glaze over the bundt cake & evenly spread using the back of a spoon. this post was created in partnership with nordic ware! find the brilliance bundt pan here.